3.sl across into ch3 space, sc, ch3, sc, ch5, sc, ch3, sc repeat around and fasten off. 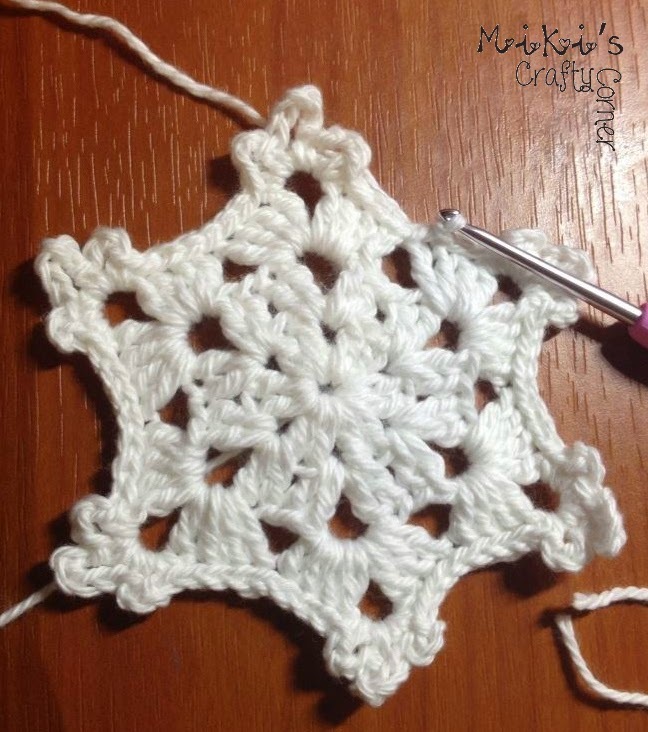 Bold and Beautiful Snow Flake Pattern FREE! 4. sl across into ch3 space, ch3 (count as dc), sc, ch5, sc, ch3, sc into ch3 space, Slip stitch all the way across to the next ch3 space (sc, ch3, sc, ch5, sc ch3, sc) into next ch3 space repeat from * to * around. On the last section you will need to slip stitch across to the first slip stitch ( this is the slip stitch that you did at the beginning of this round to get across to the 1st ch3 space) fasten off. To achieve the middle snow flake edging look sl st across 4 times ch3 sl st into same st sl across to ch3 space and do the clusters, repeat around. Wow! 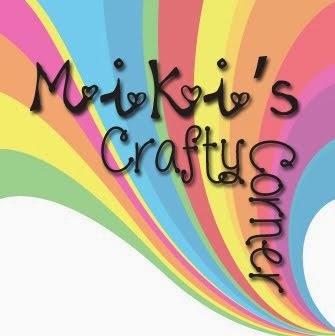 Today is a huge step for me and Miki's Crafty Corner! 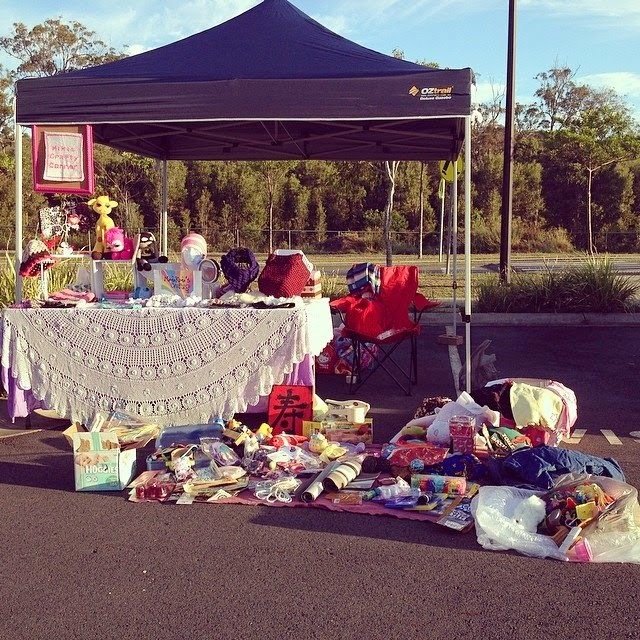 I took the chance to doing another market for my handmade items eventhough it was just a car boot sales but I have noticed a lot of people taking interest with what I've made. I even manage to hand out or get request for business cards. Previously it was just a share table with other ladies but last minute got told that her table is full, but because I have announced that I will be going to the market I cringe my teeth and forked out $200 for a gazebo as long term investment. By the looks of it I will have to work extra hard to actively going to different markets to achieve the result. I also need another table for display which I intend to save up money for that. :) Other than the frustration I had on Friday and Saturday, today indeed is a GREAT DAY! The weather was beautiful and market crowd was pretty good considering it is their first market on this location. I am scouting new location targeting the right kind of crowd. 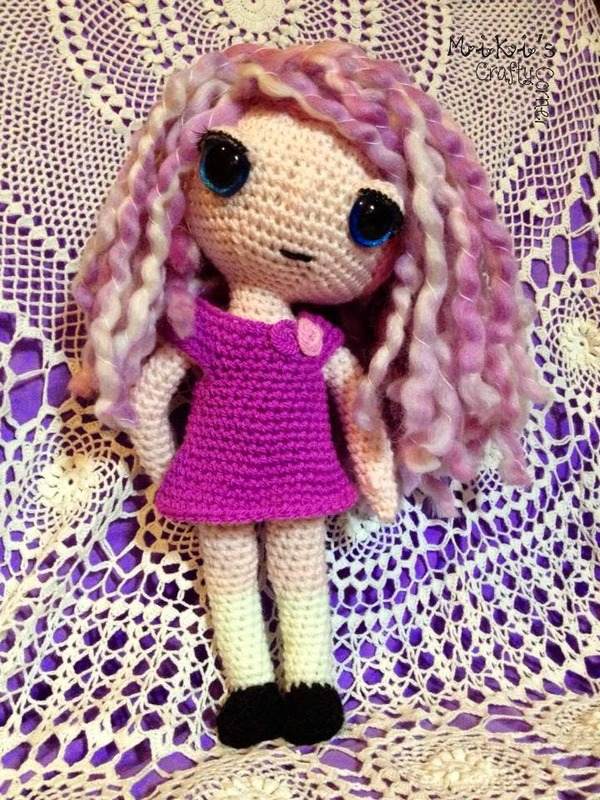 Phew~~~ I don't even know how people manage time for market while crochet stuff for it! :) Sounds crazy job to me. I have been connecting the square together for the past few weeks. It has grown bigger and bigger. 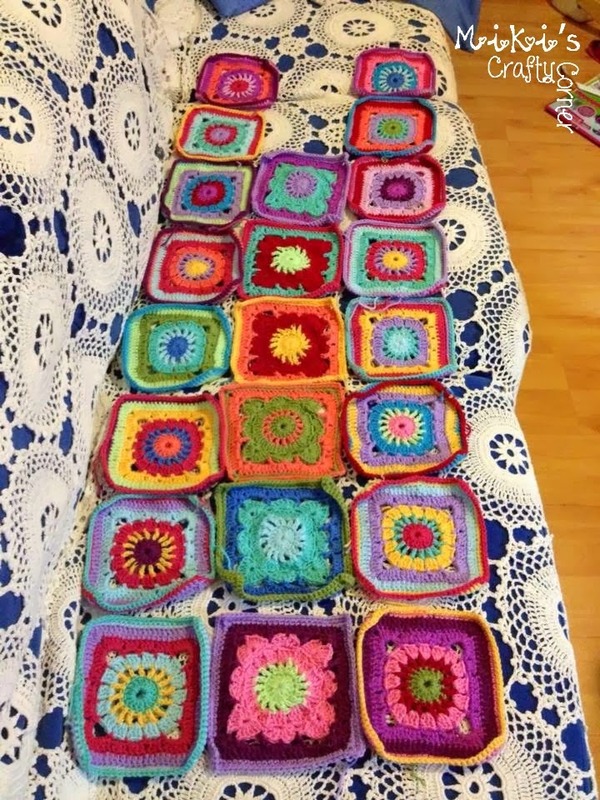 I am currently making the third square one by one and connect them whole others are waiting to be sew in when it comes to them. There are heaps of work involve but I really love the randomness in it, I just grab whatever color available and some of the color are being more use than others ops! What do you think? This week has been a little hard for me. One of my client (the owner of rainbow elephant) has lost her little angel. I feel terrible sorry and tremendous sadness as I know she has been trying so hard to stay pregnant. Although we are not very close, she is my sister in law. I often hear my husband talking about him and his brother younger days. How they used to game together and spent heaps of time together... Since his brother moved out of house, he met me and they grew apart. It's sad for me to see how life changes people. Alas it is not my say on how things and action should be done to enable once a close tight relationship. 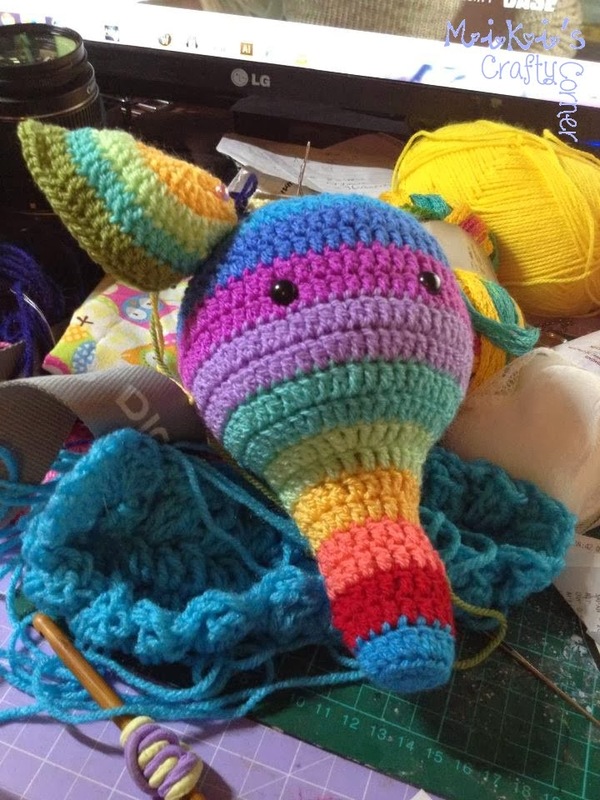 Update on elephant, it needs another ear. Learn Margaret's Double Cross Stitch on youtube now! 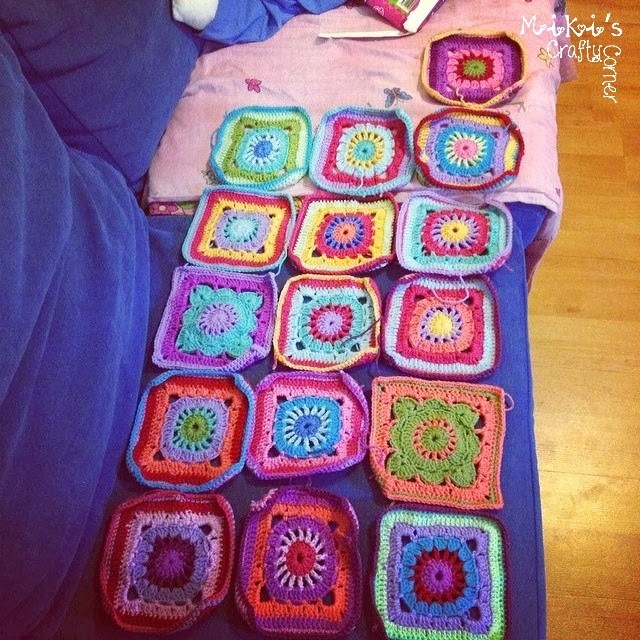 I use Stylecraft's Lucy pack, blocks are from book : 200 crochet blocks author: Jan Eaton. Great book, highly recommended. -- approx 6 1/2" width for adult scarf. If it is too wide for your liking, down size your hook. *** Please get familiar with the pictorial, it is to help you learn this new stitch. The picture shows where to put the hook through. 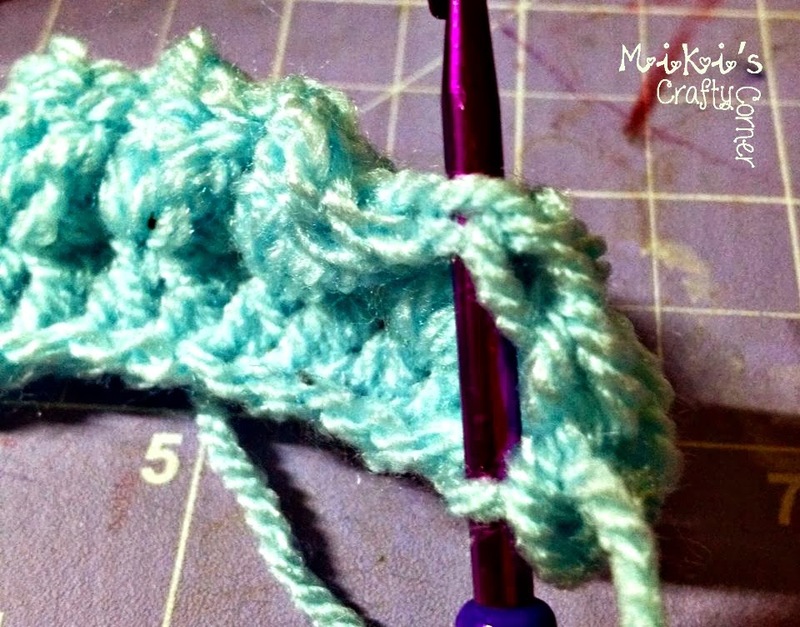 The decrease row shows you where to skip the 2 stitch that we have increase to make this stitch puff. Please watch carefully where you should skip your 2 stitch to even out the stitch count number or you will end up skipping too many and it will be uneven. Skip one stitch and go into next stitch and make 2 DC. 2DC into the stitch we skipped from behind of the first 2DC we have just worked. chain 1, turn, sc into same st, sc just before the first set of puffy stitch, skip 2 st (PIC 1) and sc the next st (PIC 2), repeat to end of row. Here you can see you skip the 2SC to obtain the puff and even out the fabric from the previous increase row. Repeat row 3 and 4 until you are satisfied with the length. 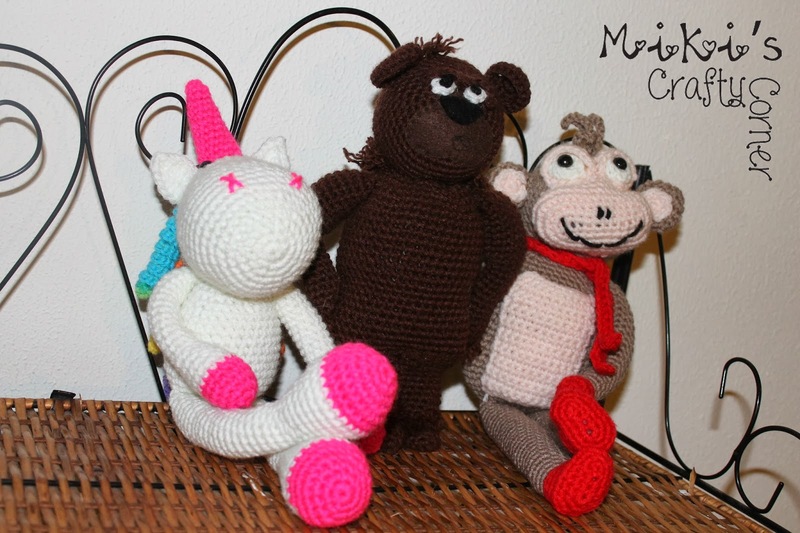 I crocheted 51inches long, cut the yarn, fasten it and sew in the tails. Copyright: This pattern may be printed for personal use only. You MAY NOT in any form reproduce or distribute this pattern in part or in whole through any venue, electronic, mechanical or otherwise without written authorization of the publisher. You are granted permission to sell the finished product for profit on limited basis only. I wouldn't mind if you would like to credit me in your work. I want to thank many friends who have contributed in testing this pattern and correcting grammar mistakes that I have made. Thank you in advance for choosing this pattern. I was approached by my client just before Christmas to make her because she ordered a Monkey who wear scarf and The Very Cranky Bear. 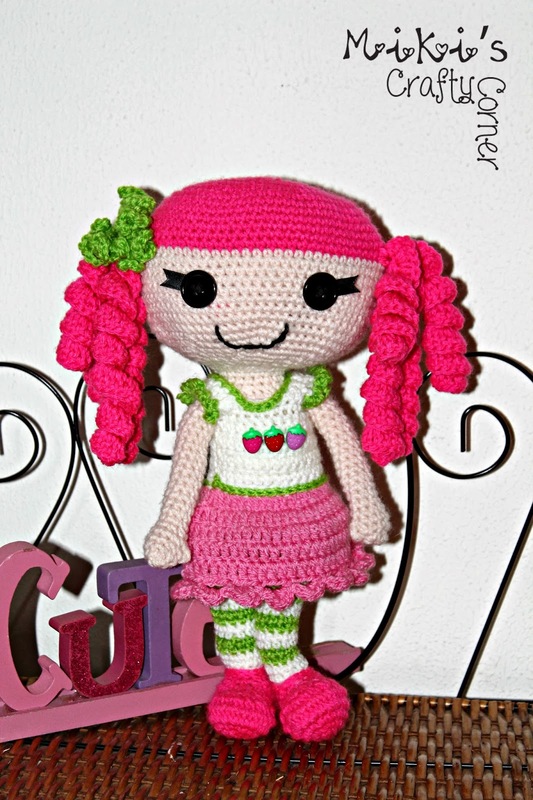 She wanted the Lalaloopsy to be a mix of Strawverry Shortcake and Lalaloopsy. 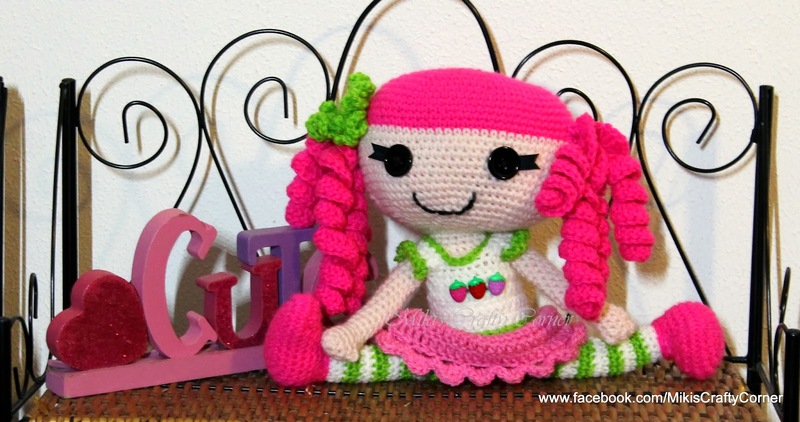 She gave me a picture of Strawberry Shortcake and put down pull amount so I can make this cutie. Here is the picture of The Very Cranky Bear and The Monkey Who Wear Scarf. Rainbow unicorn is on the far left. Alas, I did. She turned out GORGEOUS! Everyone loves her, even my girls who watched the whole process wanting to hug her. 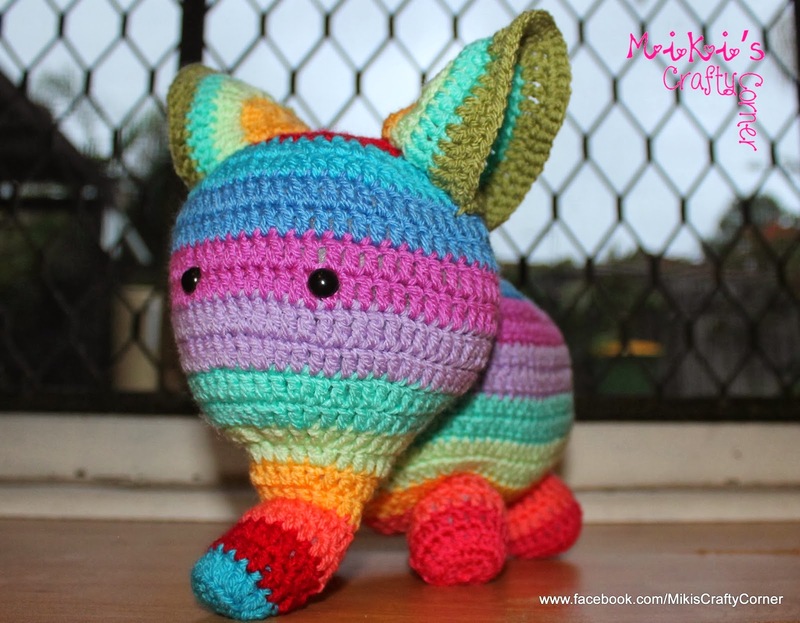 When I shared her on my facebook page : Miki's Crafty Corner it went viral. I follow the based pattern from AdoraBellaPlushies. 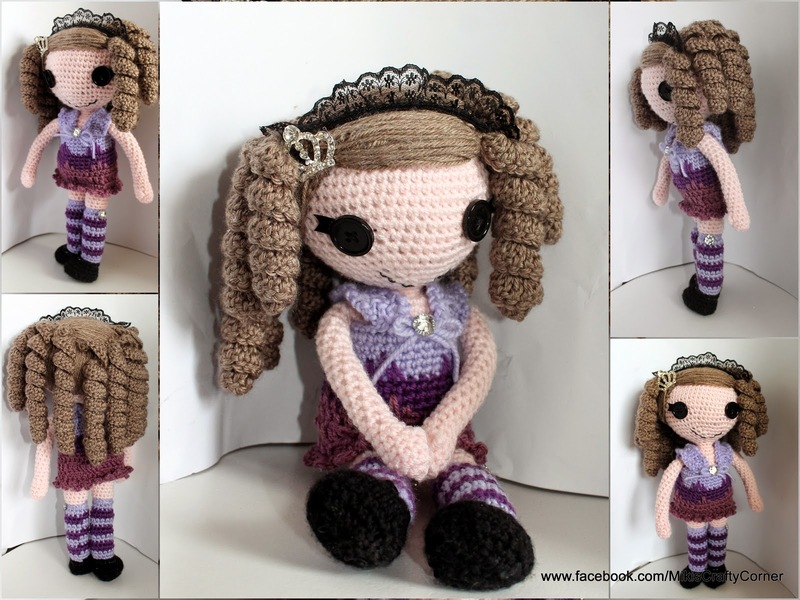 I changed the boots bigger, the rest is the same other than her clothes and headband. Yarn : 8 ply cotton, you can use pure wool if you like. 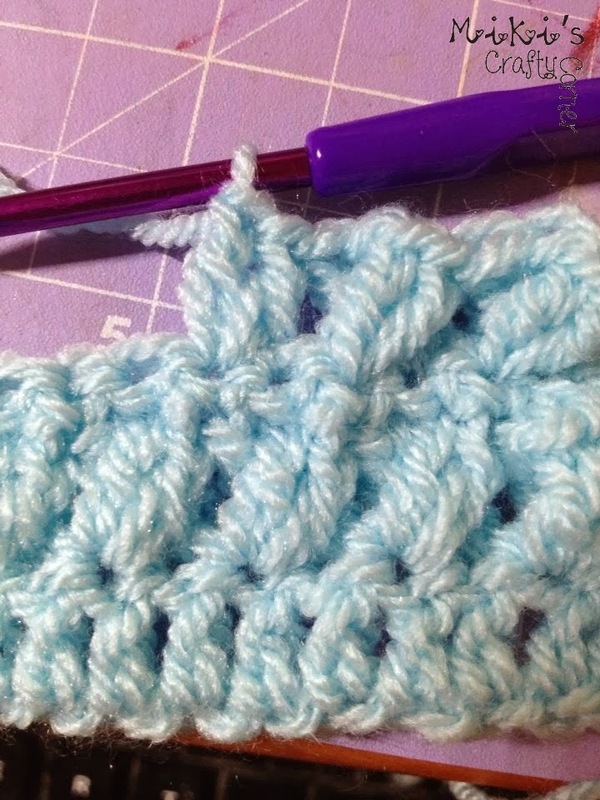 Measurement: 8ply cotton: approx 7" Pure Wool: Approx 7"
Yarn over, skip one stitch and go into next stitch and make 2 dc. Yarn over, 2dc into the stitch we skipped from behind of the first 2dc we have just worked. Row 3 - chain 3, turn, double crochet into same stitch, *dc, make Margaret's Double Cross Stitch,* repeat from * to * until the remaining 3 stitches, dc into the remaining 3 stitches. Row 21 - chain 3, turn, DC into same stitch, repeat DC to the end of row. Row 23-41 - repeat Row 21 and Row 22 Please leave a long tail for sew in the piece. 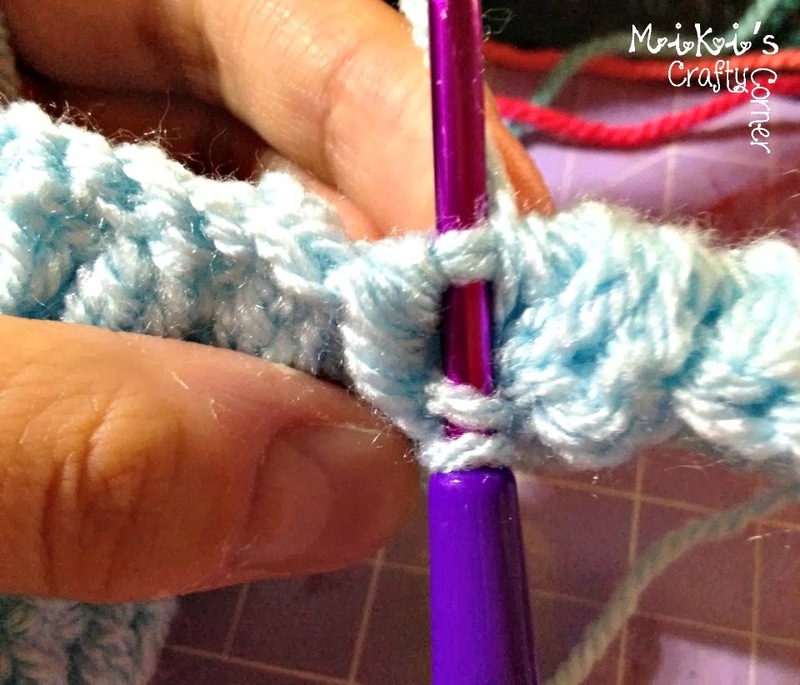 Edging - Fold the piece into half and sew around the edge, last st ch 10 and slip stitch into bottom of the stitch. Copyright: This pattern may be printed for personal use only. You MAY NOT in any form reproduce or distribute this pattern in part or in whole throught any venue, electronic, merchanical or otherwise without written authorization of the publisher. 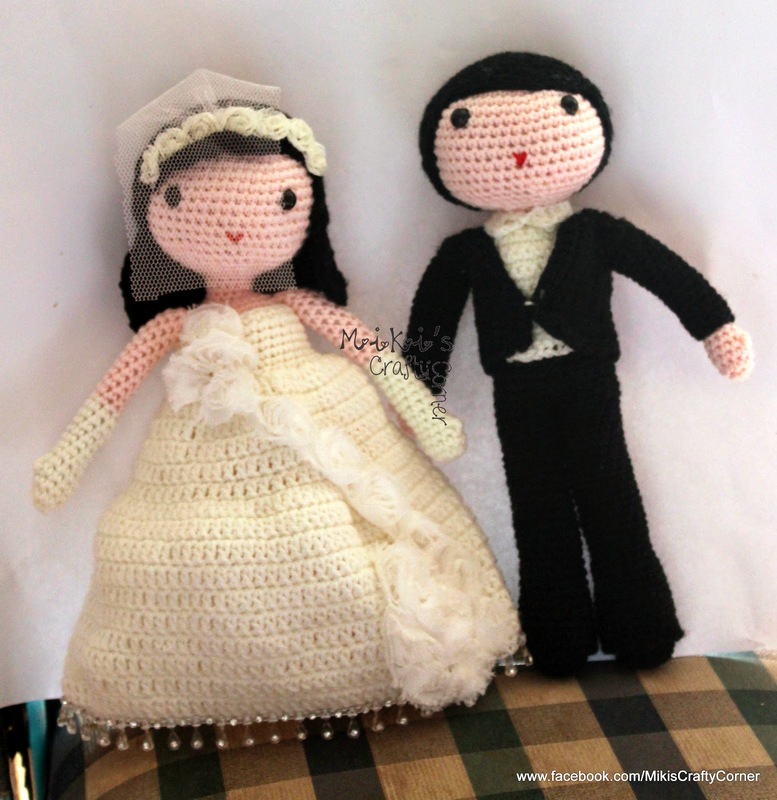 You are granted permission to sell the finished product for profit on limited basis only. I wouldn't mind if you would like to credit me in your work. Thank you in advance for choosing this pattern. This is a pattern wrote and designed by Miki Wilkins. I have wrote this pattern in honor for my mother in law Margaret because that was how I accidentally made up this stitch from making her a pot holder. If you have any question regarding the pattern feel free to contact me. After a long idle, I wasn't idle. I have been very busy on facebook. 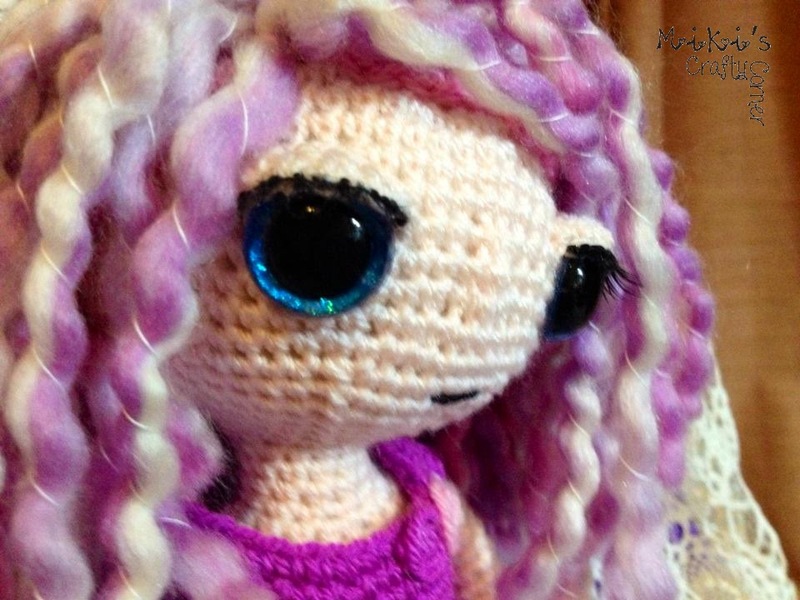 My last rant back 2012 Jun, only to find out I attempted to crochet BUT failed to do so because I didn't know what I was doing. Yes I was struggling, much more than now. I was mentally wasn't in the right place to do what I wanted to do, to achieve what I wanted to achieve. I was not focus. Looking back the 2012 me, I find myself today more confidence, more focus and more determine. I absolutely enjoy what I do now, I am beginning to see where I want to go in 5 years. 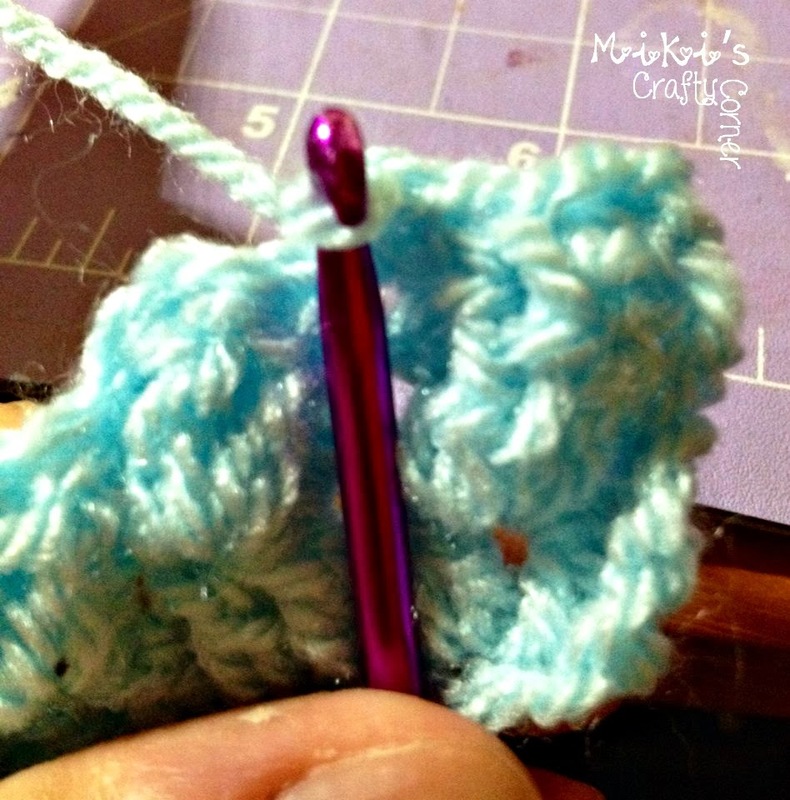 After the failed Jun 12 attempt, I stop crochet till Dec where I told myself JUST DO IT! Shhhhh Nike don't sue me for copyright! 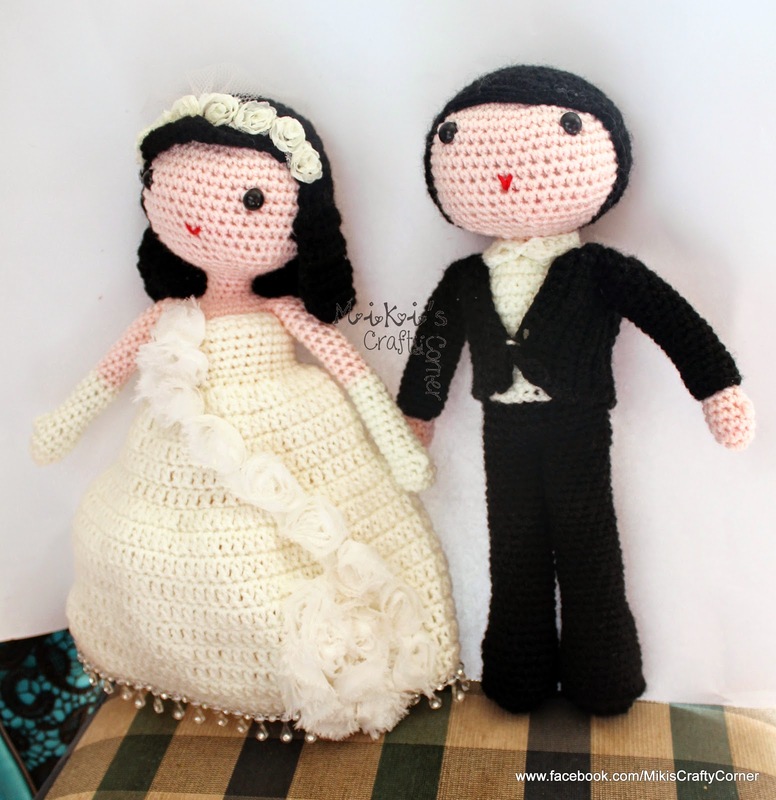 Since 2012 Dec, I have not stop crochet. I work very hard to get a grip what I was doing, many hours to how to make sense from this stupid string of fiber and hook. I was told, crochet is a SKILL and worst come to worst, FROG IT. 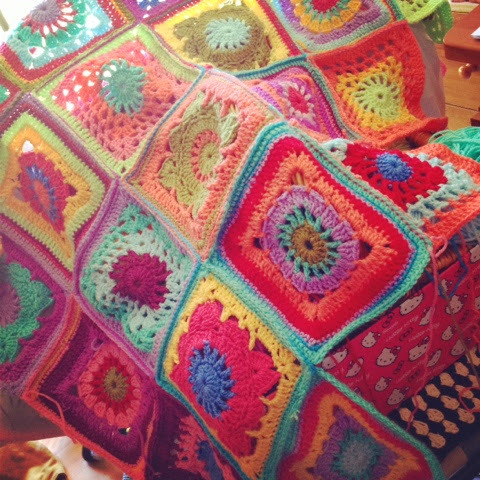 Oh yes, there is no loss in crochet, nothing is ruin unless you said so!